The December issue of CQ begins with a guide to navigating our new digital edition, "CQ Goes Digital - A User's Guide," by CQ Digital Editor Don Rotolo, N2IRZ. 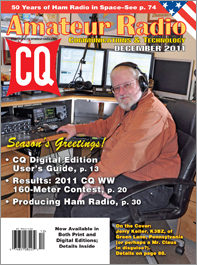 Next, we've got the results of the 2011 CQ World Wide DX 160 Meter Contests. The top scorers included: CW - EF8M (RD3A, op. ), K3ZM, P33W (RA3AUU & RW4WR, ops. ), K1LZ, CS2C (OK1RF op. ), K3WW, VE3NE, C4M (5B4AGM op.) and K8MK (N8VW op. ); SSB - W8JI (N4PN, op. ), CT3DL, CN2A (UA2FF, RN2FA & UA2FB, ops. ), K1LZ, E77DX, SP2DNI, K5RX, VE3NE and W4LJM; SSB/CW Combined - K3ZM. 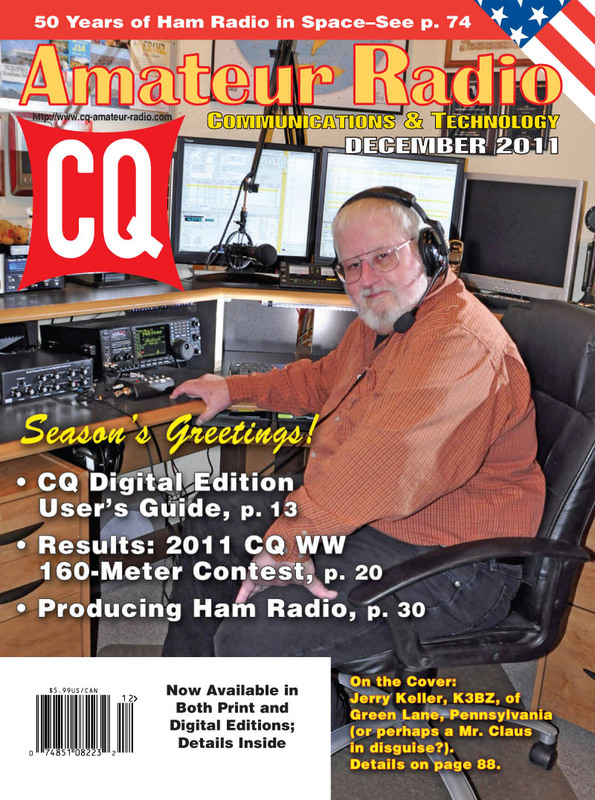 We also have the rules for the 2012 CQ DX Marathon -- remember, the 2011 Marathon ends on December 31 and logs must be submitted by January 31, 2012. The recommended Excel® spreadsheet for reporting may be downloaded from www.dxmarathon.com. Also among our features, we have "Producing Ham Radio," by John Amodeo, NN6JA, Producer of the TV comedy "Last Man Standing," with Tim Allen, on how he helped seven members of the show's staff get their ham licenses. We also have our annual index in this issue, for quick reference to every article that appeared in CQ during 2011. An updated Master Index from 1980-2011 will be posted on our website by year’s end. 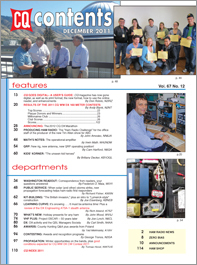 Among December's columns, "Washington Readout" editor Fred Maia, W5YI, answers questions from readers, "Math's Notes" editor Irwin Math, WA2NDM, explores the operational amplifier (Op-Amp), which is central to so many circuits today; and Public Service Editor Richard Fisher, KI6SN, turns over his column to N1IN to explain how new propagation forecasting tools are helping ham radio first responders. QRP Editor Cam Hartford, N6GA, describes his "New Rig, New Antenna, New QRP Operating Position;" Youth Editor Brittany Decker, KB1OGL, profiles young ham Brandon Tenold, KD0KMT, whose home-built repeater won first prize at the South Dakota State Fair. Kit-Building Editor Joe Eisenberg, K0NEB, reports on "the British Invasion" and introduces us to "Limerick-Style Construction." "Learning Curve" editor Rich Arland, K7SZ, discusses antennas and offers a mini-review of the DX Engineering ATSA-1 stealth antenna; New Products Editor John Wood, WV5J, looks at holiday ham radio goodies; and VHF Editor Joe Lynch, N6CL, takes us back to the dawn of the ham radio space age, the launch of OSCAR-1 50 years ago this month. (A link in the print edition to a slide show on OSCAR history was incorrect. 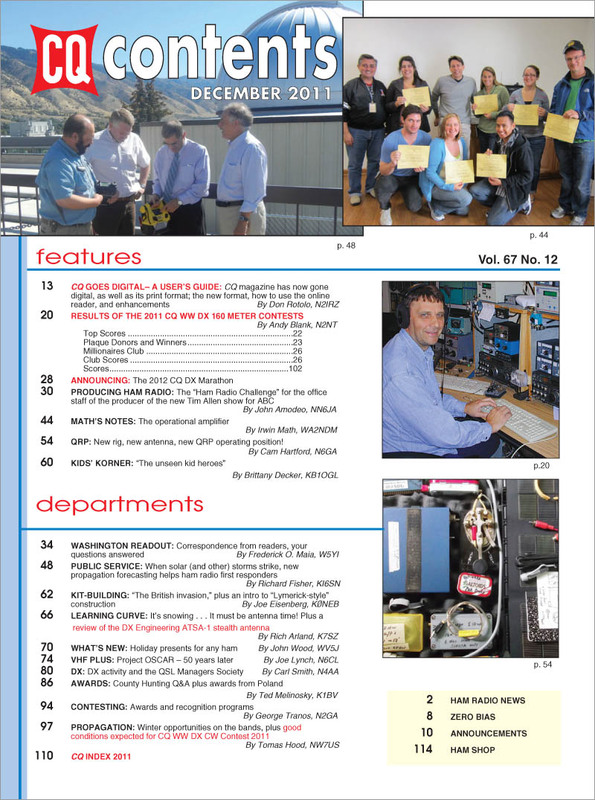 The correct URL is http://www.amsat.org/amsat-new/images/fck_images/AMSAT-OSCAR_Space_Day_5-7-11%281%29.pdf.) DX Editor Carl Smith, N4AA, looks at upcoming DXpeditions and introduces the QSL Managers Society; Awards Editor Ted Melinosky, K1BV, answers questions about the USA-CA Award and looks at the award program of Poland's national ham radio organization. Contesting Editor George Tranos, N2GA, discusses awards and recognition programs run by some contest clubs to promote more activity, and Propagation Editor Tomas Hood, NW7US, focuses on wintertime DXing opportunities. That's a brief look at what's coming up in the December issue of CQ magazine, which should be on newsstands and in subscribers' mailboxes by the end of November. The new digital edition should be available for viewing and/or downloading as of December 1. For information on becoming a CQ subscriber, click here. Happy holidays from all of us at CQ!